Glad to know im not going mad! Well, if you are, I beat you to it. I've been playing with BBDs lately. Lotsa fun, those too. Through zero flanging perhaps? Are you aware that Mike Irwin (where is he now?) designed a TZF using just one BBD? I missed this - sorry I didn't reply sooner. 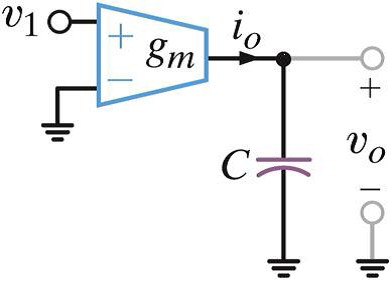 Is it the phase delay design that Mike based his on? Mine is through zero, but it uses more than 1 BBD (it uses 8 ). I'm working on a pitch shifting application now. First off, Mr. Stites, a hearty "thank you" for taking the time and energy to share this with us. This filter sounds good (I am a sucker for filters.) 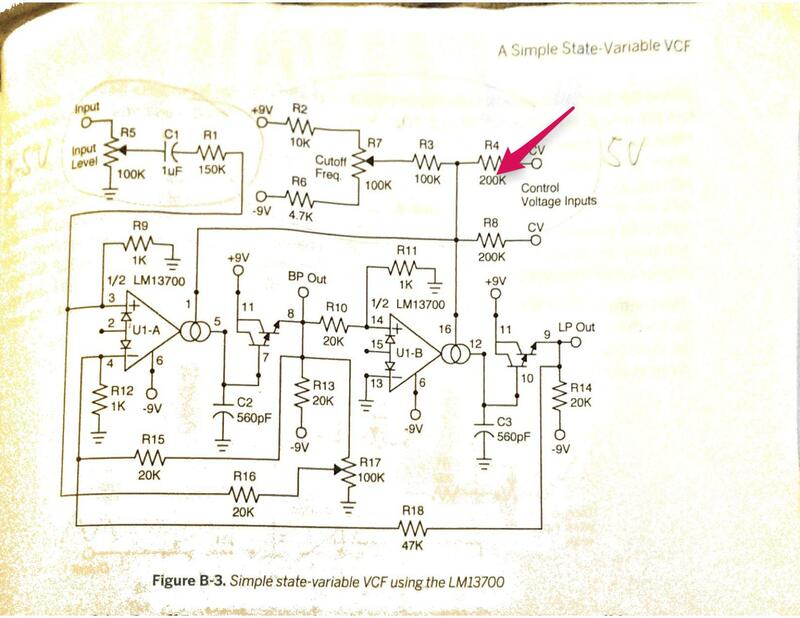 Secondly, any idea if or how it would behave on -12/+12v? Especially if someone is looking to a Euro-format board? Thanks again. Dang - how did I miss this one, too? Anyway, I've never tried it with +/-12V - I'm sure it could be made to work at that level if it doesn't out of the box. My THAT transistor version was still on the breadboard - after four years, it still actually works. I recorded a short sample of it and posted it to the THAT FB page just to put a bug in their ear that maybe, some day, the analog resurgence will make it viable for them to make a similar IC as the 2040. Just found out about this thread. Nice Job, Scott! I'm impressed how fat the filter sounds with only two poles. Secondly, any idea if or how it would behave on -12/+12v? It works well on +/-12v with no changes. I imagine someone with a better grasp of transistor circuits could tweak a few resistor values, but based on my first build I don't think it's critical. It certainly sounds great and behaves as expected with no adjustments. I did change two resistor values: R37 to 39k and R32 to 5.6k. That gives very usable self-oscillation (R37) and eliminates some 'thumping' in the audio that was occurring at high CV values (R32). I also connected the frequency pot between +12 and ground, not +12 and -12, which gives a much more comfortable range. This really is a thick filter... excellent work, Scott, and thank you for sharing! For those of you interested in a PCB, I'm working on one now with Scott's blessing. I'll offer it over at Muff's, but I'll do my best to keep this thread updated as it comes to fruition. Awesome! You just saved me a ton of work. This is awesome, because just a few hours ago I was Googling discrete VCF designs. Should the 1nf be poly? I assume the 220's can be ceramic. I used 1 nF polystyrene caps; the 2N7 was a mylar cap. And, yep, 220s can be ceramic. i designed an SMD version of the 2N3904/2N3906 schematic - alas - it doesn't work! the circuit does pass audio, but it has this wierd "thumping" to it, that is effected by the frequency pot. the resonance pot doesn't seem to do much. after double, triple and quadruple checking the schematic against my eagle file, i wanted to ask if anyone could point me towards proper troubleshooting stages to go through etc... not sure if scott would be cool with me posting the eagle files, but i'd love to do so if thats okay with him. if it's possible to get this baby running, it would be one monster of a filter 2/3rds the size of a creditcard! everything was wired correctly, i just failed to ground an unused section of my TL074, it was oscillating like crazy!! it's a beautiful filter, WOW!!!! thank you so much for sharing scott!!! There is a technical mistake in the original schematic. R10 and R14 in the original schematic, that provide local negative feedback to the individual filter sections, should be removed in order to make this a true state-variable filter. With them in circuit, the frequency response is impaired compared to a true SVF. Then they are present, the filter sections are standard low pass sections. With them removed, they change from low pass sections, to integrators, and then the larger feedback loops from R7 and VR1/R37 can work properly. The result will be corrected rolloff at higher frequencies for the low pass output, and correct responses for the bpf and hpf outputs. I always eyed this one, so if you proceed, please report about this matter! I think you are also active on GDIY? The links you've provided are for a different filter topology, as you mentioned. It is possible he copied them from there I guess, but he's a pretty smart guy (I've read all his stuff), so I don't think it was an intentional mistake, it looks like an accident. The local feedback fixes this as a single low pass pole in the context of a multi-pole filter. As such, it has a specific transfer function: 1/(s+1). Note the lack of local feedback. ...note the feedback loops go from after the first integrator to the input, and from the last integrator to the input, only. This particular arrangement correctly solves for the high, band, and low pass outputs respectively. Which you probably already know. What is interesting, is that if you add back in the local feedback in this context, you actually change the transfer functions (quite drastically), and with high resonance, the shapes are extremely weird. It could be musically interesting, but it's not a "normal" SVF. The most notable effects are the band pass doesn't drop below unity gain at low frequencies, and the high pass ends up looking more like a high shelf. It looks quite strange in a simulator like LTSpice. 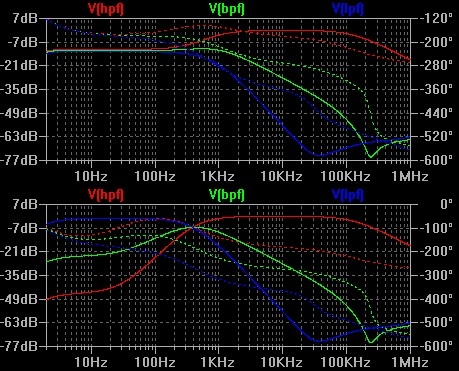 I've attached the current circuit frequency response simulation (top image), and the version with those resistors removed (bottom image). there are two resistors bearing the R14 denominator, I called the second one R14A. re the R10/R14 changing the filter's characteristics...in my book, that means versatility, so I am going to switch them in and out of circuit with a DP on/off panel mounted switch...any thoughts on this? Ah yes, now I see that (the duplicate R14). today i fired up my strip-board version of this filter. I would suggest that you must have made some kind of wiring error. The circuit, without R10 and R14 is the standard Variable State Filter configuration, and hence, should be inherently stable. Maybe try and go over and triple check the way it's been hooked up. Posted: Mon Aug 22, 2016 1:02 pm Post subject: uncontrollable SVVCF build. I finally figured out why you were having issues with my suggested modification so I re-drew the original schematic to show the issue. (EDIT: I've removed the schematic here as it had errors, read on to the next post to see the corrected schematic).